The rain had let up but the wind was howling Monday when I pulled into the parking lot at Airport Greens in Willoughby Hills. This was the first chance I had to play since returning on March 30 from my "Affordabili-TEES'' vacation in Virginia and North Carolina. It also was going to be my first round locally since December, and I was determined to get out there as long as playing conditions were not hideously bad. David G. Miller, director of golf operations at Airport Greens, cited a recent look at the weather report while suggesting that I pay for nine holes and see how I felt after that before committing to an additional nine holes. With the bag on my trusty pull cart, an protected against the elements by a rain suit, I headed for the first tee. Into wind gusting up to 30 miles per hour, the 325-yard par-4 opening hole played at least 100 yards longer than that. The story was the same in every hole except the par-3 sixth hole, where the wind seemed to be helping more than hurting. From the back tee at what my range finder told me was 233 yards, I hit a pretty well-struck 3-metal to the front of the deep green. Shortly after teeing off at the sixth, I took a detour into the service barn to chat up course owner/operator and do-pretty-much-everything guy Gary LaConte. He was doing repair work on a mower. Sitting on an adjacent chair was superintendent Dennis Kelly. LaConte comes from one of Northeast Ohio's best-known golf families. His grandfather, Pat LaConte, helped run the long-gone Tam-a-Rac Country Club in Willoughby before he and Gary's dad, Richard, opened Parkview in Mayfield Heights, another course that has passed into history. 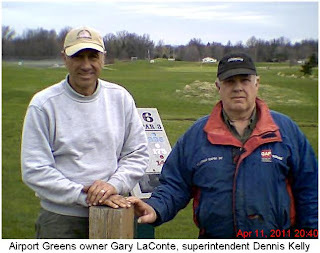 Richard LaConte designed Airport Greens, which opened in 1989 on a parcel of rocky land owned by Cuyahoga County across Richmond Road from the county airport. "My dad did the design and I did the routing,'' Gary LaConte said of Fairway Pines. This is year 21 of the 60-year lease the LaConte family has on Airport Greens. Business is down from the times-are-good peak of 31,000 rounds per year to about 21,000 per year, Gary LaConte said. Speaking for myself, I have spent hard-earned money playing golf at Airport Greens in recent years and will continue to do so. This course is a regular stop for me for various reasons...it is easily reached from my home in Eastlake; the price is right and the test of golf is stiff enough for my game; the course has a links-y feel; it's a good walking track I can get around in three hours or so; sorry about this Gary, but it's usually not that busy when I slip out on weekdays. Playing conditions have steadily improved at Airport Greens since its opening. First time I played the place, I wrote it off as a rock pile with too many rough edges. It's in much better all-around shape now. I especially like the way Gary LaConte has dotted many holes with grassy hillocks that penalize wayward tee shots or approach shots. "You need some level of difficulty out there,'' LaConte said. There aren't any great holes at Airport Greens, but there are plenty of good ones. The par-4, 250-yard 4th hole is a personal favorite. So are the par-4, 390-yard 7th, the par-5, 485-yard 12th, the par-3, 155-yard 17th and par-3, 190-yard 18th. Moving to back tees increases the degrees of difficulty on the 17th and 18th holes. Airport Green has a good driving range. Right now, Miller is still operating out of the off-season pro shop near the range. Soon, he'll move back to the ranch home-style clubhouse. There are some public-course snobs who look down their noses at Airport Greens. It's a free country. They should feel free to play elsewhere. As for me, I'll feel just as free to continue making this place a regular stop on my Northeast Ohio golf travels. A final aside....with the proposed expansion of Cuyahoga County Airport now in budgetary and political never-never land, it appears there will be no encroachment on the Airport Green property.